President Obama signed legislation into law on Monday, August 16, that authorizes the United States Mint to strike 2012 Star Spangled Banner commemorative coins. Public Law 111-232 was introduced as H.R. 2097 in the U.S. House by Rep. Dutch Ruppersberger on April 23, 2009. It passed in the House on September 9, 2009, and in the Senate on August 2, 2010. 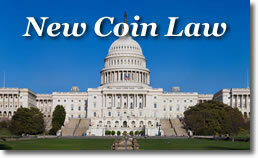 Entitled the Star-Spangled Banner Commemorative Coin Act, the new law authorizes up to 600,000 coins to celebrate the bicentennial writing of the Star-Spangled Banner by Francis Scott Key. Key wrote the poem after a 25-hour British bombardment of Fort McHenry, in Baltimore, Maryland, during the War of 1812. The poem was named The Defence of Fort McHenry, with a note by Key saying that it should be sung to the tune of the British melody To Anacreon in Heaven. It was later renamed to Star-Spangled Banner and officially became the national anthem for the United States in 1931. The Star-Spangled Banner Commemorative Coin Act permits up to 100,000 $5 gold coins and a maximum of 500,000 silver dollars for issue during the calendar year beginning on January 1, 2012. The coin designs must be "emblematic of the War of 1812 and particularly the Battle for Baltimore that formed the basis for the Star-Spangled Banner," include the inscriptions of value, ‘2012’, ‘Liberty’, ‘In God We Trust’, ‘United States of America’, and ‘E Pluribus Unum’. Each silver dollar will be composed of 90 percent silver and 10 percent copper, weigh 26.73 grams and a diameter of 1.500 inches. In contrast, each $5 gold coin will be made from 90 percent gold and 10 percent alloy, weigh 8.359 grams and have a diameter of 0.850 inches. Surcharges for the bicentennial commemorative coins — $35 for the $5 gold piece and $10 for the silver dollar — will go to the Maryland War of 1812 Bicentennial Commission to support bicentennial activities, educational outreach, and preservation and improvement activities pertaining to the sites and structures relating to the War of 1812. Wow – you mean the president is capable of doing something in honor of America? This IS a first!